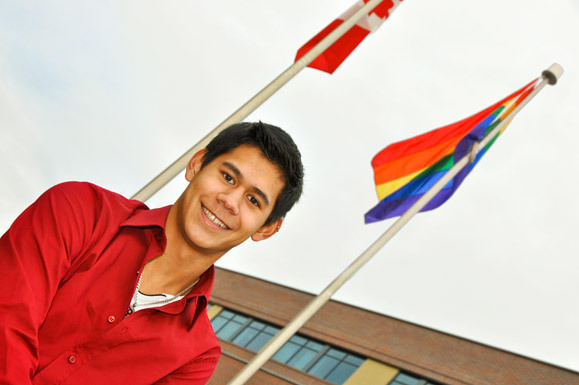 University student Daniel Sadler was on hand for Monday afternoon's OutWeek flag-raising ceremony at UBC Okanagan. Daniel Sadler is not only pursuing a higher education, but a higher purpose. The second-year history student at UBC Okanagan is actively involved with numerous campus and community initiatives aimed at creating a more inclusive, safer, happier and healthier community for everyone, no matter their race, gender or sexuality. From coordinating campaigns that promote responsible drinking on campus to working as a volunteer coordinator with the Okanagan Rainbow Coalition, Sadler devotes countless hours to support his peers. "I'm running a youth group right now in the community called Out With Friends for questioning, queer, and bisexual youth," says Sadler. "It's part of the Okanagan Rainbow Coalition, which I'm a member of. Out With Friends gives people the opportunity to gather, hang out and be exactly who they are. "A lot of students struggle with their identity -- personally and sexually -- and everyone takes their own time to figure it out. I think the more programs that are available and the more opportunities people have to just relax and be themselves, the more comfortable they will be and the more healthier a community we will live in." Sadler is also a volunteer coordinator for Okanagan Pride, which plans a festival each August, and has met with Mayor Sharon Shepherd to discuss the LGBQTTI (lesbian, gay, bisexual, transgender, queer/questioning, transsexual, two-spirit, and intersex) youth initiative and why it is important to building a healthy, desirable community. "On campus, I'm working with the UBC Okanagan Health and Wellness Centre coordinating the Alcohol Intelligence Campaign -- a two or three day informational event held each March -- that aims to empower the student body to make good decisions around drinking," says Sadler. "And I'm involved with Campus Life in a program called Good Morning Commuters, which really is about creating camaraderie on campus by getting out and giving away free coffee and Timbits to commuters first thing in the morning." And Sadler does this all as a full-time student who has his sights set on law school. "Daniel is deeply committed to issues of social justice," says Ilya Parkins, Assistant Professor of Gender and Women's Studies. "This really shows in the classroom, where he brings an amazing liveliness and curiosity to discussions and to his work. I'm particularly impressed, though, with the way he integrates his academic pursuits with his volunteer work on campus and in the city - he offers some great examples of how we can get the university and the community working together." Sadler hopes his volunteer work will not only help to create understanding and support for the LGBQTTI community, but for everyone who faces inequality. "Personally, I get involved because I think it's important that everyone is allowed to develop into the person they are on their own time," says Sadler. "When people are restricted based on gender, sexuality or race -- and it's all connected; you can't view these problems with social stigma separately -- our society loses out. I think by addressing one issue, you are addressing them all; when you fight for equality in one area, you win it for all, ideally."